Are you looking to give your web presence a reboot? Maybe it’s looking like its seen better days, and you need to breathe some new life into your tactics. These days, websites do more than just prove your business is online; they're the digital front doorstep to your brand. When properly designed, they can act as a powerhouse jam-packed with features and innovations – from easier shopping experiences, through to funky widgets and interactive elements. Beyond that, these platforms can be powered up with the right security measures to keep your business out of harm's way – something that's becoming more and more critical in the modern age. So, how is it that businesses are still holding back on giving themselves a website makeover? Essentially, there are a number of reasons, but losing Google search rankings and hard-earned SEO results is a concern many businesses carry, alongside having to maintain a platform they don't know a whole lot about. After many years of building up SEO through content, blogs and healthy links from external sources, no one wants to lose their prime real estate on Google for the sake of a shiny new website. The good news is that you don’t actually have to. At all. There are plenty of measures you can take to keep your rankings on the up, and all those nifty figures in the green. It is more than doable to preserve your rankings while enjoying the many features of a website refresh. You just have to consider your approach carefully. What kinds of changes need consideration? 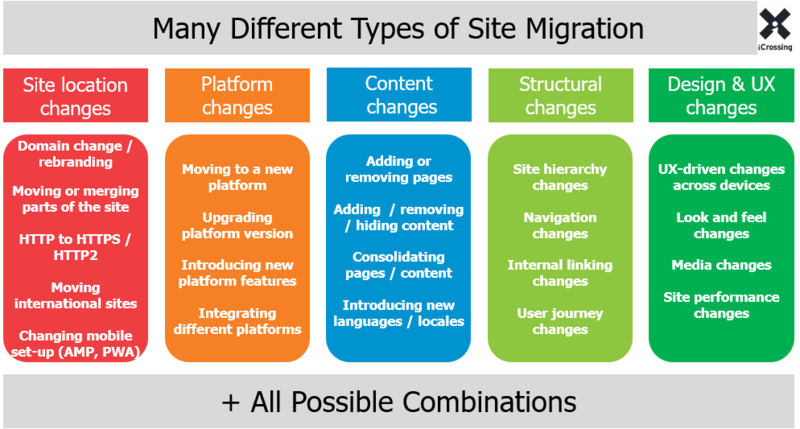 There are many elements to a website migration, and every step has the potential for something to go wrong. But with an expert in tow, you can easily avoid these dramas. Domain name change: When altering your domain name, you need to consider two elements that you will want to be ported over to your new domain. First, you will want all of your current visitors, subscribers and customers to come across with you. Secondly, you want your search engine rankings and links from other websites to stay current as well. Alerting your audience is a simple process, usually taken care of through email or social media alerts (or both). Porting your SEO and links is another kettle of fish altogether. You can ask all of the pages linking to you to change the domain name, but there is no guarantee that this will occur. The best way around this is a 301 redirect, where visitors to your old page will automatically be re-routed to your new domain. When in doubt, have an expert (like ours) take care of the nitty-gritty details here. URL structure change: Every element of your website, your posts, your blogs and all of the other pages associated with your site, have their own permanent URL (or permalink) associated with them. Moving to a new domain can cause these links to become broken or non-existent, which can be detrimental to your SEO results. It is important that all of these permalinks have their URL updated or redirected or potential clients are going to be met with the dreaded '404 not found' screen of death. CMS changes: This is the part where all of your content is shipped over to your new domain, where it's stored on a content management system (CMS). Depending on your domain, provider and platform, the CMS will differ from one website to another. Our simple-to-use system is designed to let you make changes through a self-serve solution, letting you get minor changes on your site done quickly, without the added need for tech-heavy knowledge. However, if it's not conducted correctly, a lot can go wrong with a CMS migration, so it is important to have every element of your old website backed up just in case. This includes all of your content, files, design, layout and graphics. Hosting provider change: Changing your website is going to impact your SEO for multiple reasons. Firstly, the server location is going to impact the Google algorithms on a base level. Because one of the algorithm's organisational tools is search results based on relevance and the location of your new server, this move can potentially change your position in the rankings. To avoid any complications, it is best to transfer your website across when traffic is at its lowest. Consider whether there a point in the week where traffic to your website lulls. Maybe late at night or on weekends is the best approach to take. Or there could be a seasonal time of the year where traffic tends to dip. Find these times and make a move when these numbers are on the decline. Using this tactic has multiple benefits, including minimising the risk of something going wrong for a visitor at your old website, while less traffic means more server power to push your platform across to your new domain. Nothing. It's important to practice patience during the changeover, as it takes time for Google to re-index URLs. It's likely that there will be inevitable fluctuations as the crawling takes place – a process that can potentially take weeks to complete. However, by moving your website across in stages, you can help limit the impact of this drop in rankings. Should I port my entire website at once or do it in sections? It is better to move it over in sections so that you can monitor if there is any impact on traffic or search indexing. To do this, choose a part of your website that is used and visited less frequency as a test pilot, before moving the rest of the sections across. How can I test how many pages were indexed? Google has its own indexed pages checker, so you can test before and afterwards to ensure your pages were crawled following the move. How long will it take for Google to notice my URL changes? There is no set time frame, unfortunately, with a range of variables impacting the move, including the size of your website. As a rule of thumb, it can take anywhere from four days to four weeks to complete. Will redirected links from external pages hurt my rankings? Most of the time, 301 or 302 redirects will give you the same ranking points as if the browser clicked directly. You have likely noticed these different options appearing in your website URL, but not put too much thought into it. However, there are key differences to take into account, and these need to be addressed when migrating your URL. The difference between HTTP (Hypertext Transfer Protocol) and HTTPS (Hyper Text Transfer Protocol Secure) is very important when it comes to SEO and website positioning. Both of these terms relate to how data is transported around the internet, with HTTPS providing an extension to HTTP for extra security. This is called the Secure Sockets Layer (SSL). HTTPS offers security against cyber-attacks, which is beneficial for your business and its visitors. It also provides secure payment services for the customer, which is especially important when 13 per cent of all cart abandonment is due to customers having issues with the protection of their payment details. Importantly, Google also announced in 2014 that HTTPS is considered a ranking signal, effectively favouring platforms that have this element activated. If your website still sends data using the HTTP prefix, it is important to upgrade to HTTPS with your migration, in order to improve your SEO and positioning – not to mention the security benefits that come with it. The easiest and safest way to migrate to a new website is to hand the keys over to the experts. Website Design has the full raft of tools and experience to build you a new site on a domain that will reel in more conversions and attract new audiences. From responsive website design, through to e-commerce functionalities and easy updates – we've got plenty of digital marketing weapons in our tool belt to help you power up your business. Don’t risk losing your hard-earned SEO and website rankings – let us take care all the hard yards for you. Contact us today on 1300 367 009 for your free quote now.